The atmosphere transports heat throughout the globe extremely well, but present-day atmospheric characteristics prevent heat from being carried directly from the equator to the poles. 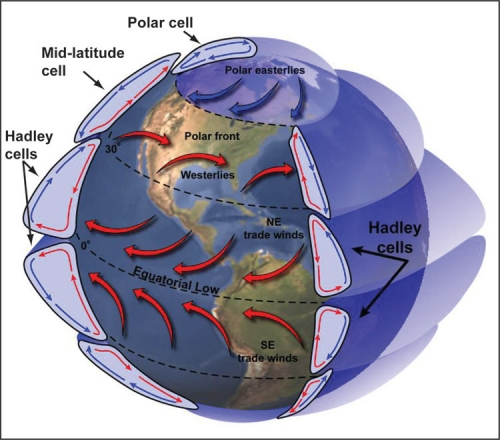 Currently, there are three distinct wind cells – Hadley Cells, Ferrel Cells, and Polar Cells – that divide the troposphere into regions of essentially closed wind circulations. In this arrangement, heat from the equator generally sinks around 30° latitude where the Hadley Cells end. As a result, the warmest air does not reach the poles. If atmospheric dynamics were different, however, it is plausible that one large overturning circulation per hemisphere could exist and that wind from the low-latitudes could transport heat to the high-latitudes. As an explanation for equable climates, Brian Farrell presented this idea in 1990 and advocated that during equable climates, the Hadley Cells extended from the equator to the poles (Farrell, 1990). Hadley cells, Ferrel (mid-latitude) cells, and Polar cells characterize current atmospheric dynamics. 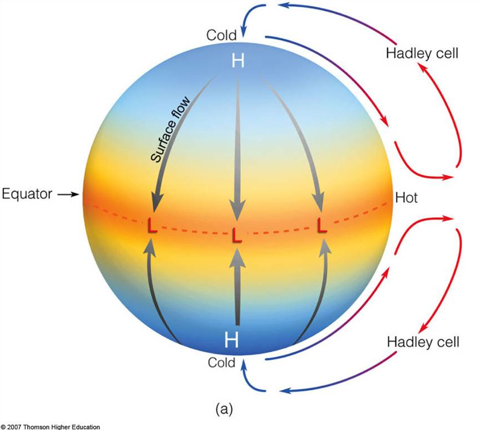 Hadley Cells are the low-latitude overturning circulations that have air rising at the equator and air sinking at roughly 30° latitude. They are responsible for the trade winds in the Tropics and control low-latitude weather patterns. 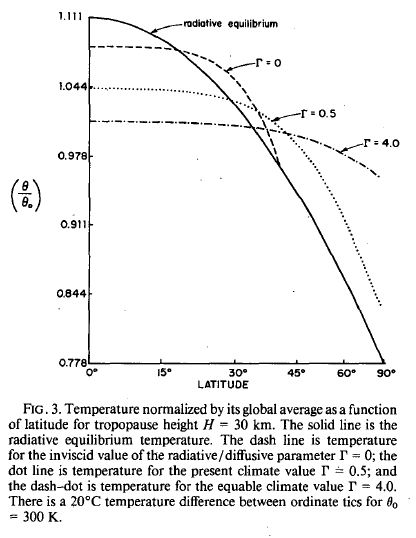 Held and Hou (1980) outlined the dynamics of this circulation through a simplified model of the Hadley Cell. For the model, there are three main assumptions. First, the Hadley Cell circulation is constant. Second, the air moving toward the poles in the upper atmosphere conserves its axial angular momentum, while the surface air moving equatorwards is slowed down by friction. Third, the thermal wind balance holds for the circulation (Vallis, 2006). For simplicity, the model is also symmetric around the equator. These initial assumptions make the explanation of Hadley Cell dynamics much simpler. Angular momentum is defined as the cross product of a particle’s distance from the axis of rotation, r, and the particle’s linear momentum, p. In the Hadley Cell as an air particle moves toward the high-latitudes, it becomes closer to the Earth’s spin axis, so r becomes smaller. If angular momentum is conserved in the Hadley Cell as Held and Hou (1980) assume, p must become larger to balance the decrease in r. P equals mass times velocity. Since the mass of the air particle cannot change, the velocity of the particle must increase. In the case of the Hadley Cell, the velocity in question is the zonal (east-west) velocity, so as the particle moves poleward, the velocity must increase in the eastward direction. Eventually, the zonal velocity is so strong that the particle stops moving poleward and only travels to the east. At this latitude, air sinks, and then to close the loop, it returns to the equator along the surface. Therefore, because of the conservation of angular momentum, Hadley Cells exist only from the equator to the mid-latitudes. This scenario holds as long as the initial assumptions are valid. Brian Farrell, however, argues that the assumptions are not accurate for equable climates and that during equable climates, angular momentum is not conserved in poleward moving particles (1990). He claims that angular momentum sinks, essentially sources of friction, could have been stronger during the Eocene and the Cretaceous. Farrell estimates that the friction term in his model would increase by eightfold under equable climate conditions. This change would prevent angular momentum from being conserved. In this situation, the zonal velocity would not become strong enough to stop air from moving poleward. Instead, air from the equator would be able to travel all the way to the poles in extended Hadley Cells. Based off of Venus’ atmosphere’s behavior, Farrell argues that another way to extend the Hadley Cells would be to increase the height of the tropopause. This change would increase the poleward moving air’s Rossby number. The Rossby number describes the importance of the Coriolis force in atmospheric dynamics. A higher Rossby number means that the Coriolis force has a smaller impact on a particle, so if the height of the tropopause increased enough, the Rossby number would become high enough to make the Coriolis force negligible. As a result, particles would not diverge from their path as they moved poleward, and the Hadley Cells would reach the poles. To explain how the tropopause height could increase, Farrell states that the height is correlated to surface temperature and that a 1°C increase in sea surface temperature causes the tropopause potential temperature to rise by roughly 7.5°C. Raising the average equatorial sea surface temperature to 32°C from its current 27°C would increase the potential temperature of the tropopause by 37°C. There temperature increases would almost double the static stability at the tropopause. For the height to increase, the stratosphere would also have to become less stable. If CO2 concentrations increased and if stratospheric ozone concentrations decreased, the stratosphere would cool substantially, and this change would destabilize the stratosphere. As a result of the alterations to tropospheric and stratospheric stability, the tropopause height would increase. Farrell estimates the height would have doubled under Cretaceous conditions, and as a result, the Rossby number would have doubled. This change would have allowed the Hadley Cells to extend to the poles and would have made equable climates more likely. Hadley cells could extend all the way to the poles. (Image courtesy of Lyndon State College Atmospheric Sciences). While each of these alterations to the atmosphere would extend the Hadley Cells, Farrell found that a combination of the two effects was necessary to make his model’s results agree with proxy data from equable climates. 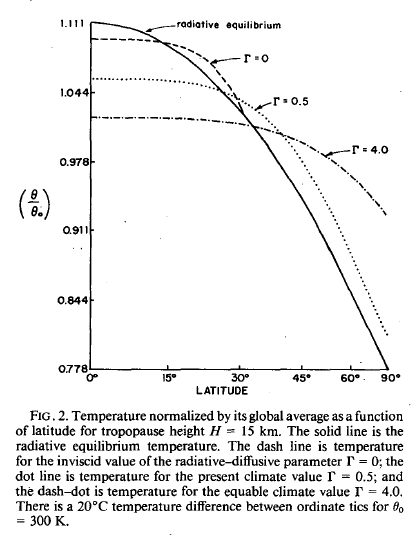 He graphed the atmosphere’s potential temperature versus latitude at different tropopause height and friction values. The results reveal that as tropopause height and friction increase, the EPTD decreases. A doubling of the tropopause height combined with an eightfold increase in the friction term leads to an EPTD of 16°C. This value agrees with Cretaceous climate reconstructions. As a result, Farrell’s theory seems to be a reasonable explanation for equable climates. The main problem is that Farrell does not provide any explanation for why angular momentum sinks would have become stronger during the Cretaceous and the Eocene. He provides a few examples of potential momentum sinks: “small scale diffusion…, cumulus momentum flux…, gravity wave drag…, and the net westward force arising from potential vorticity mixing by large scale waves” (Farrell, 1990). However, he does not explain why any of these sinks would have become stronger during the Eocene and, thus, would have prevented angular momentum from being conserved. This lack of information in the argument makes the theory harder to accept, and until this portion of the argument is explored in greater depth, Farrell’s theory cannot be accepted as the correct explanation of equable climates. Farrell’s theory about the extension of the Hadley Cells has a mathematical basis, and he argues his case through the derivation of atmospheric dynamics equations. He starts with an overview of the work done in Held and Hou (1980) and then modifies the equations to account for his ideas. In a similar manner, the following information will walk through the work done by Held and Hou and then will present the modified equations derived by Farrell. These steps follow sections 11.2 and 11.3 in Atmospheric and Oceanic Fluid Dynamics by Geoffrey K. Vallis (2006). These steps demonstrate that if friction and eddy fluxes can be ignored, then air moving towards the pole in the Hadley Cell will conserve its angular momentum. This fact means that an air parcel moving polewards must accelerate zonally as it moves toward the high-latitudes, so the zonal velocity will increase with latitude. 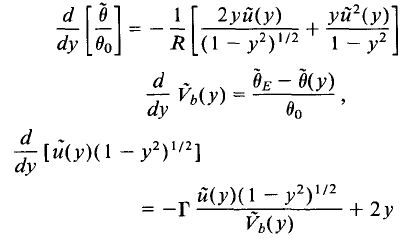 In these equations, R stands for the Rossby wave number, and Γ represents “a measure of the relative dominance of the radiation and momentum time scales” and can be thought of as a friction term (Farrell, 1990). R = gHϑ/ω2 a2, and Γ = SτR/ϑhτ v. These equations have a solution with a Hadley Cell beginning at the equator where Vb(0) = 0 and ending at the poles where Vb (yH) = 0. R and Γ determine this solution and, thus, are important factors for the Hadley Cell circulation. As mentioned before, the height of the tropopause has a significant impact on the extent of the Hadley Cells. Looking at Farrell’s equations, one can now see how this fact is true. The height, H, is influential in determining the value of the Rossby wave number. If the height doubles, the Rossby wave number will also double. Using the first of Farrell’s equations, one can see that an increase in the Rossby wave number will decrease the change in potential temperature over latitude. This change will cause the temperature gradient to decrease throughout the extent of the Hadley Cell. Since the Hadley Cells extend as the Rossby wave number increases, the Hadley Cells will extend to the poles if R increases enough, and thus, the EPTD will decrease significantly. Similarly, Γ plays an important role in atmospheric dynamics. It is important to note that the amount by which a torque will decrease angular momentum depends on the mass flux Vb, which is determined by SτR, which is part of Γ. In an inviscid atmosphere, Γ is set to zero, but in an atmosphere with friction, it must have a non-zero value. 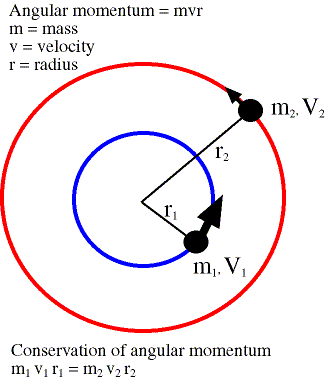 Since Γ determines how much a torque will decrease angular momentum, the zonal velocity decreases as Γ increases. Therefore, if Γ increases substantially, a large enough torque could be generated to prevent the formation of a zonal wind strong enough to stop an air parcel from moving poleward. As a result, a large Γ value could enable the Hadley Cells to extend all the way to the poles. This change would allow warm air from the equator to reach the high-latitudes and would reduce the EPTD to levels seen during equable climates. Therefore, one can see that R and Γ are highly influential on the extent of the Hadley Cells. If both parameters increased enough during the Cretaceous and the Eocene, the Hadley Cells could have extended all the way to the poles. Under these conditions, air from the equator would have traveled all the way to the high-latitudes and would have heated the poles enough to have caused the equable climates.